Desanya, the saxophonist performed the melodious saxophone instrumentals with support from Kenny K’ore who speaks in tongues and also voices some parts of the popular song from Infinity’s groundbreaking ‘Olori-oko’ album. According to the unassuming Desanya, the collaboration came about while he was worshiping one morning and the Holy Spirit ministered the title of the song to him. He immediately reached out to Kore (formerly of Infinity) and that was it. The song was produced by Joshua of Hilltop studios. Desanya began his foray into the world of music at the tender age of ten, serving as the church pianist at the RCCG parish where he worshipped before he was 16. During this period, he developed a strong passion for the saxophone, which is now his major instrument, though he also plays the guitar and talking drum. As a born-again Christian, he identifies God as the source of his inspiration. And with his saxophone, he has been able to define his own unique style of afro centric music, that is a blend of traditional sounds and contemporary rhythm, which never fails to inspire his audience anywhere he performs. His talent and prowess on the saxophone has taken him to various concerts, churches, weddings and other events. He has also played as backup for the popular ace saxophonist, Segun Oluwayomi. A sweeping national effort to extend health coverage to millions of Americans will leave out two-thirds of the poor blacks and single mothers and more than half of the low-wage workers who do not have insurance, the very kinds of people that the program was intended to help, according to an analysis of census data by The New York Times. Those excluded will be stranded without insurance, stuck between people with slightly higher incomes who will qualify for federal subsidies on the new health exchanges that went live this week, and those who are poor enough to qualify for Medicaid in its current form, which has income ceilings as low as $11 a day in some states. People shopping for insurance on the health exchanges are already discovering this bitter twist. “How can somebody in poverty not be eligible for subsidies?” an unemployed health care worker in Virginia asked through tears. The woman, who identified herself only as Robin L. because she does not want potential employers to know she is down on her luck, thought she had run into a computer problem when she went online Tuesday and learned she would not qualify. The 26 states that have rejected the Medicaid expansion are home to about half of the country’s population, but about 68 percent of poor, uninsured blacks and single mothers. About 60 percent of the country’s uninsured working poor are in those states. Among those excluded are about 435,000 cashiers, 341,000 cooks and 253,000 nurses’ aides. The disproportionate impact on poor blacks introduces the prickly issue of race into the already politically charged atmosphere around the health care law. Race was rarely, if ever, mentioned in the state-level debates about the Medicaid expansion. But the issue courses just below the surface, civil rights leaders say, pointing to the pattern of exclusion. Every state in the Deep South, with the exception of Arkansas, has rejected the expansion. Opponents of the expansion say they are against it on exclusively economic grounds, and that the demographics of the South — with its large share of poor blacks — make it easy to say race is an issue when it is not. In Mississippi, Republican leaders note that a large share of people in the state are on Medicaid already, and that, with an expansion, about a third of the state would have been insured through the program. Even supporters of the health law say that eventually covering 10 percent of that cost would have been onerous for a predominantly rural state with a modest tax base. “Any additional cost in Medicaid is going to be too much,” said State Senator Chris McDaniel, a Republican, who opposes expansion. But the Supreme Court’s ruling on the health care law last year, while upholding it, allowed states to choose whether to expand Medicaid. Those that opted not to leave about eight million uninsured people who live in poverty ($19,530 for a family of three) without any assistance at all. Poor people excluded from the Medicaid expansion will not be subject to fines for lacking coverage. In all, about 14 million eligible Americans are uninsured and living in poverty, the Times analysis found. The federal government provided the tally of how many states were not expanding Medicaid for the first time on Tuesday. It included states like New Hampshire, Ohio, Pennsylvania and Tennessee that might still decide to expand Medicaid before coverage takes effect in January. If those states go forward, the number would change, but the trends that emerged in the analysis would be similar. 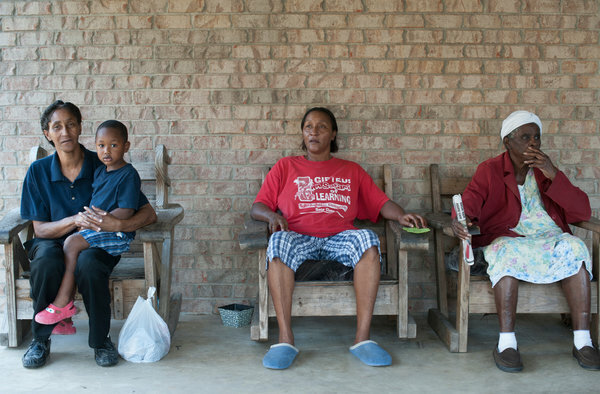 Mississippi has the largest percentage of poor and uninsured people in the country — 13 percent. Willie Charles Carter, an unemployed 53-year-old whose most recent job was as a maintenance worker at a public school, has had problems with his leg since surgery last year. His income is below Mississippi’s ceiling for Medicaid — which is about $3,000 a year — but he has no dependent children, so he does not qualify. And his income is too low to make him eligible for subsidies on the federal health exchange. “You got to be almost dead before you can get Medicaid in Mississippi,” he said. He does not know what he will do when the clinic where he goes for medical care, the Good Samaritan Health Centerin Greenville, closes next month because of lack of funding. The states that did not expand Medicaid have less generous safety nets: For adults with children, the median income limit for Medicaid is just under half of the federal poverty level — or about $5,600 a year for an individual — while in states that are expanding, it is above the poverty line, or about $12,200, according to the Kaiser Family Foundation.There is little or no coverage of childless adults in the states not expanding, Kaiser said. The New York Times analysis excluded immigrants in the country illegally and those foreign-born residents who would not be eligible for benefits under Medicaid expansion. It included people who are uninsured even though they qualify for Medicaid in its current form. Blacks are disproportionately affected, largely because more of them are poor and living in Southern states. In all, 6 out of 10 blacks live in the states not expanding Medicaid. In Mississippi, 56 percent of all poor and uninsured adults are black, though they account for just 38 percent of the population. Dr. Aaron Shirley, a physician who has worked for better health care for blacks in Mississippi, said that the history of segregation and violence against blacks still informs the way people see one another, particularly in the South, making some whites reluctant to support programs that they believe benefit blacks. That is compounded by the country’s rapidly changing demographics, Dr. Geiger said, in which minorities will eventually become a majority, a pattern that has produced a profound cultural unease, particularly when it has collided with economic insecurity. The decision not to expand Medicaid will also hit the working poor. Claretha Briscoe earns just under $11,000 a year making fried chicken and other fast food at a convenience store in Hollandale, Miss., too much to qualify for Medicaid but not enough to get subsidies on the new health exchange. She had a heart attack in 2002 that a local hospital treated as part of its charity care program. About half of poor and uninsured Hispanics live in states that are expanding Medicaid. But Texas, which has a large Hispanic population, rejected the expansion. Gladys Arbila, a housekeeper in Houston who earns $17,000 a year and supports two children, is under the poverty line and therefore not eligible for new subsidies. But she makes too much to qualify for Medicaid under the state’s rules. She recently spent 36 hours waiting in the emergency room for a searing pain in her back.